Divider Wall Section, 26"h x 60"l x 6"w - Norbert's Athletic Products, Inc. Choose from these colors. Hover over a color to see its name. COLORS MAY NOT BE EXACT - Due to the many variations in monitors and color calibration, colors viewed here may not be exact. Vinyl samples are available upon request. 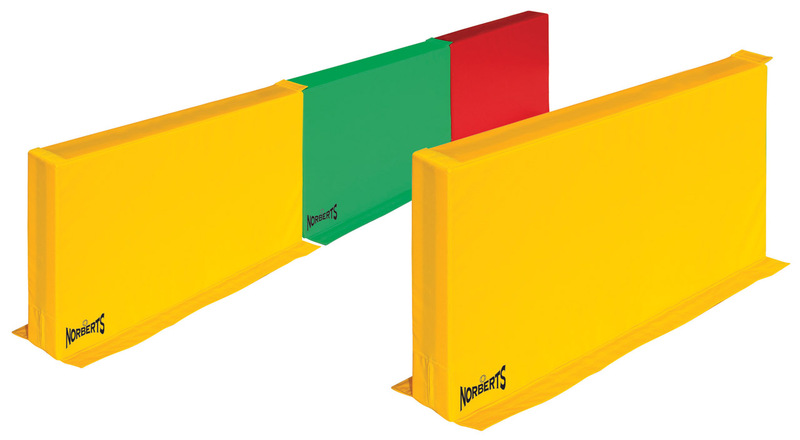 Developed with Kids First Sports Center, these moveable walls are great when you need to divide the floor or other carpeted space between classes. Hook and loop fasteners on the bottom sides and flaps means these walls don't get pushed out of the way easily. Each measures 26" high x 60" long x 6" thick and is available in any of the vinyl colors. Custom sizes are available. Click the button below to add the Divider Wall Section, 26"h x 60"l x 6"w to your wish list.